The teaser video for the 400km / 248mi brevet in September is already out! The time limit is 27 hours. The question now is, will my buddies and I ride it? Seven of us were in a three-vehicle convoy to Malacca on Friday afternoon. We had lunch at the McDonald’s on the KL – Seremban Highway, near the Sungai Besi Toll Plaza. It is an easy 133km / 83mi drive from that McDonald’s to the Fenix Inn Melaka. Our base for the weekend. There was still some important preparation to be done for the long ride ahead. My power nap burned through all the calories from lunch. Some of us walked around the corner for dinner. Roasted chicken rice, some of the eponymous chicken rice balls, and an omelette. The roasted chicken was very good. The rice balls were mushy and disappointing. The rice balls would have been better if there was a bit of chicken inside each one. By 6.45pm we were ready to roll. We all had additional storage on our bikes to supplement our saddlebags. Essential items for a long ride like this were one or more power banks to recharge cyclocomputers, lights and mobile phones, extra stocks of energy bars and N8 Endurance drink mix, and small medical kits. We had prepared as well as we knew how. Nevertheless we were all a bit nervous at the thought of covering slightly more than 400km / 249mi in 27 hours. None of us had ever ridden that far before. Ken (third from the left) had good reason to be more nervous than we were. His longest ever ride had been only 140km / 87mi, he was on a borrowed bicycle, and he was wearing tennis shoes. The event organisers were at the McDonald’s Dataran Pahlawan before 7.00pm to hand out the brevet and cue cards for the ride. Before I go any further, I must convey a big Thank You to the volunteers who ran this event so smoothly. Jess Lim, Ray Lee and Chong Su at Checkpoints 1 and 3. Stefaaniem Choo at Checkpoint 2. Johnny Lee on his scooter. Sam Tow in the Audax Landrover Defender. And Jaykay helping out where needed, while at the same time riding most of the route. 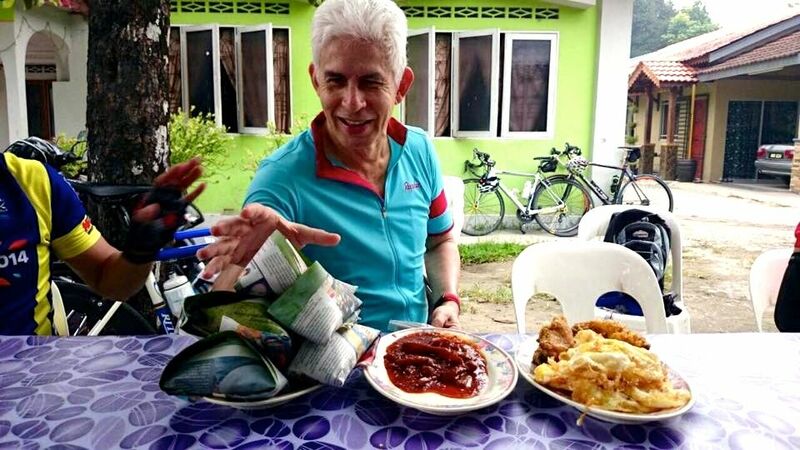 By sundown the area was teeming with riders anxious to get their brevet and cue cards, and to make the first of the many, many, many pedal revolutions needed to get to Skudai and back to Malacca. Including one rider on this specially badged bike. Kudos to the organisers for a much-improved card distribution process. 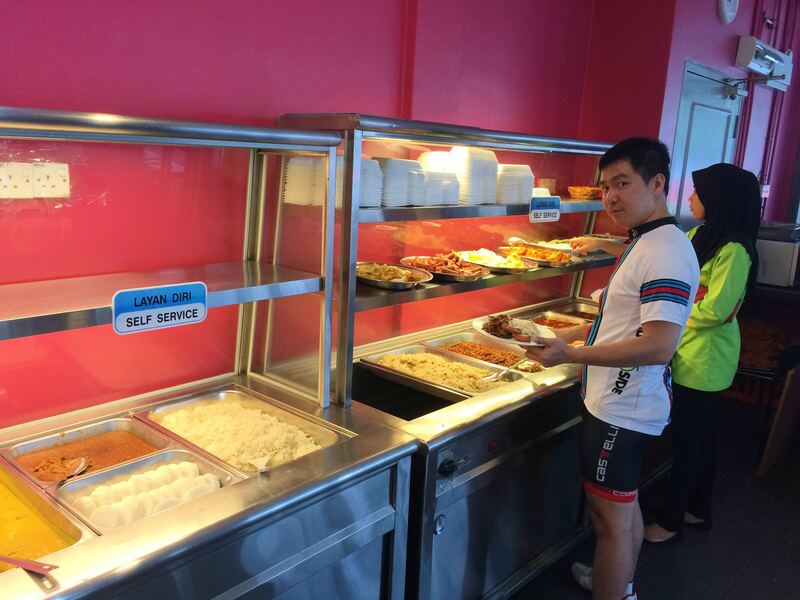 There was no repeat of the long queues we saw at the Audax BRM200 early this year. Minutes after arriving at Dataran Pahlawan, we were ready to go. We headed first to a Malacca landmark, the historic Dutch Stadthuys, for a photograph. The short ride to and from the Stadthuys took us through a procession of lighted trishaws, a distinctive feature of Malacca. I wish I could blame the dazzling lights for my leading the group down the wrong side of the McDonald’s at Dataran Pahlawan to start the ride. 409km / 254mi to go, and we picked up some unnecessary extra distance right out of the gate by going the wrong way. The real culprit was being too dependent on the cue card, excellent though it was, and not studying the route beforehand. This was the first of a few lessons about riding Audaxes that we learned over the next 27 hours. Fortunately we were soon back on track, and following a string of blinking red lights southeast along the coast toward Muar. Our mantra for the night was “start slow, finish strong.” We kept our speed below 30kph / 19mph as we rolled through Muar and on to Checkpoint 1 at Kompleks Niaga Benteng Peserai, in Batu Pahat. I was in new territory as the clock ticked toward midnight. I had never ridden my bike that late at night before. I think it was a new experience for everyone in the Flipside group. Team Flipside got to Checkpoint 1 together. The cue sheet read 93.5km / 58mi. Our cyclocomputers showed 7km / 4mi more, given our unplanned detour through Malacca. Every time I participate in an organized cycling event, I see something new. Someone on a bike with an “AUDAX BRM400” label on the down tube, a Specialised S-Works Mclaren Venge, or a unicycle, or an Elliptigo. This time it was unusual footwear for a long-distance ride. Those are flip-flops on the feet of the second gentleman from the left. Don’t laugh. The last I saw of him and his riding companion, both on small-wheel bikes, were their rear lights disappearing into the distance at more than 30kph / 19mph. After getting our brevet cards stamped, we grabbed some of the sports drink on offer. 100 Plus very kindly donated 1,200 bottles of their Edge non-carbonated isotonic drink to this event. We also needed something to eat. Given the late hour, the pickings were slim at the Kompleks Niaga Benteng Peserai. We needed some help. Each rider must be self sufficient. No follow cars or support of any kind are permitted on the course. Personal support is only allowed at checkpoints. Luckily we had the benefit of support from a person who has local knowledge. My biker chick is from Batu Pahat, and she, together with my mother-in-law, met us at Checkpoint 1. She would also meet us fourteen hours later, at Checkpoint 3. Her advice was to cross the road and eat at the Restoran Ceria Maju Klasik. It was an excellent suggestion. Fried rice done in a variety of styles, some fried eggs, and sweet teh tarik. Just what we needed to set us up for the next leg to Skudai, 113.5km / 70.5mi away. We stuck to our plan to keep the pace below 30kph / 19mph, and continued to ride as a group of seven. At 2.30am, an hour after we left Batu Pahat, we started seeing lightning and hearing thunder in the distance. By 3.30am the roads looked like this. Marco and I had rain jackets, and we were happy to ride on. The other Flipsiders did not have wet weather gear, and as the rain got heavier, they decided to take shelter at a bus stop. The rain came with a strong tail wind. Marco and I were glad to be pushed along for as long as possible. We sailed through Pontian Kecil, dodging puddles and ride down the center of the deserted roads. It was a lot of fun for the next 12km / 7mi, until we realised that we should have made a left turn in Pontian Kecil. Which brings me to the second and third lessons about riding Audaxes. Lesson 2 is always put your cue card where you can easily refer to it. Taped to the handlebar or top tube. Not in a jersey pocket, which makes retrieving the card a hassle. It is even more of a hassle when your rain jacket covers your jersey pockets. Lesson 3 is once you do pull out your cue card and realise that you missed a turn, it is better to double back to the turn that you missed. That is a much smarter option than trying to navigate to the next checkpoint on your own, in the hope of not having to ride too many extra kilometers. Suffice to say that instead of arriving at Checkpoint 2 in Skudai at about 5.30am, as originally anticipated, Marco and I got there at 8.00am. Admittedly, thirty minutes of that additional time was spent getting a drink and some you char koay at Bukit Indah, when a hunger bonk threatened with 15km / 9mi still to go before Checkpoint 2. By the time we stopped for a snack, we had burned ninety minutes on stop-start riding as we navigated through unfamiliar territory via Waze and Google Maps. Including a failed effort to stay off the Malaysia-Singapore Second Link Expressway. We finally had to accept that the shortest route from where we were, in Kampung Ulu Pulai, to Checkpoint 2 meant riding for 6km / 3.7mi along that expressway. That misadventure added another 28km / 17mi of unnecessary riding to our total mileage. Marco and I put a brave face on things as we finally arrived at the McDonald’s on the Skudai-Pontian Highway. The five others rolled in to Checkpoint 2 an hour later. I thought that they might have lost their way as well. But no. They all napped for a couple of hours while they waited out the rain. A McDonald’s Brekkie Wrap with Sausage had called my name. All the tables were occupied by riders who had arrived before us. So I pulled off my wet shoes and socks, and perched on the curb of the Drive Thru lane. The other guys got a table when they arrived. It was 9.00am and we were halfway through the BRM400. We had fourteen hours to cover the 202km / 126mi back to Dataran Pahlawan in Malacca. That felt possible. Despite the faces in this photograph. 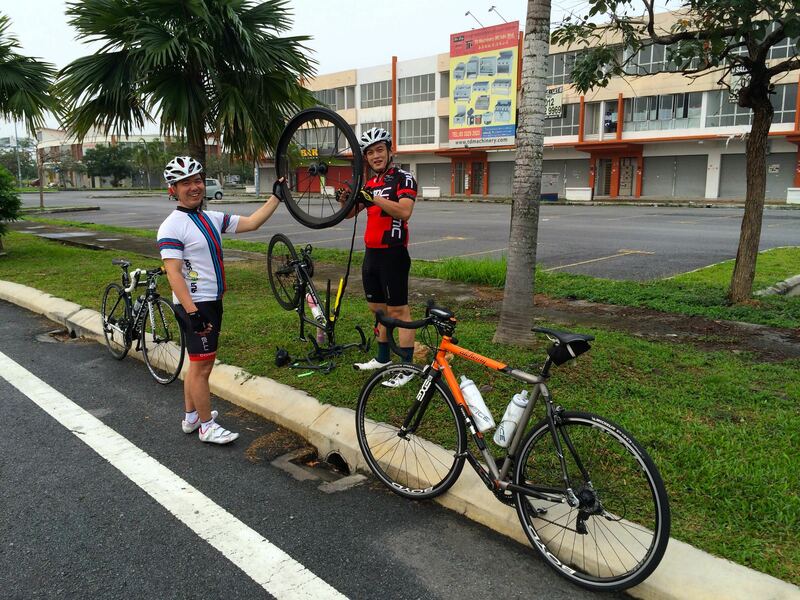 Posted in Cycling in Malaysia and tagged Audax BRM400, Batu Pahat, Dataran Pahlawan, Flipside, Malacca, Melaka, Muar, Skudai. Bookmark the permalink. This is what my Flipside friends and I do. We inflict pain on ourselves, and each other. We cover triple digit distances. We push ourselves faster and for longer than is comfortable. We climb for fun. We bake under a blazing sun. After we get our breath back and cool down a little, we say “Thank you for the great ride,” and make plans to do it all again together at the earliest possible convenience. None of us has said it, but we surely subscribe to the following. Yesterday’s 140km / 87mi jaunt from Taman Megah to Ijok and the “Big Box” around Bestari Jaya was the latest in the long chain of rides that, I guess we believe, contributes to better living. We started at dawn. The brightening sky foretold the hot, cloudless conditions to come. But not before an unusual treat. It got very misty as we approached the Paya Jaras interchange on the Guthrie Corridor Highway. Riders literally emerged out of the fog, feeling cool and sporting frosted eyewear. I’ve never seen it so misty on the GCE. We exited at the Paya Jaras interchange and headed toward Kuala Selangor. Our breakfast stop was in Ijok. Nasi lemak, noodles, chicken rice, toast with kaya, half-boiled eggs. Restoran Ijok served it all. Along with lots of coffee. I only noticed the graphic on Leslie’s bandana when looking at the photographs of this ride. It wa an appropriate image. I was feeling one-eyed by the time we got back to Taman Megah, about 100km / 62mi after we ate in Ijok. After breakfast the pace, unsurprisingly, picked up as we covered the right and top side of “the box.” The roughly square outline around Bestari Jaya. Kampung Kuantan sits at the top left corner of the box. Home of the Fireflies Park. Also home to this shaded bus stop, where we parked ourselves for a rest. We blasted along the third side of the box, thanks to a very fast pull from Liang. The run along the bottom of the box wasn’t that much slower. After finishing the box we all needed the cold drinks and air conditioning at the PETRONAS station in Ijok. We still had 60km / 37mi to ride. It was getting on to 11am by the time we left Ijok for the second time that morning. The skies were clear, and the sun was hot and bright. The heat took its toll. We made two more drink stops within 25km / 16mi of Ijok. 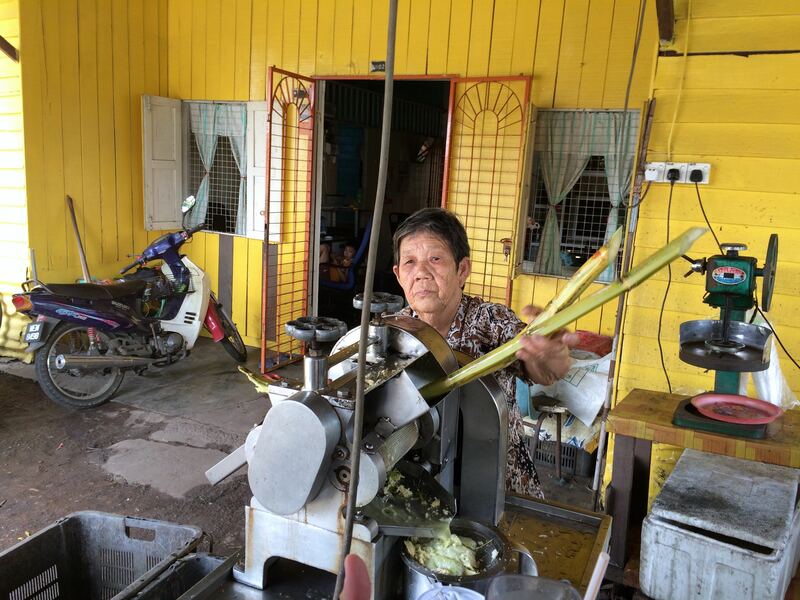 Once at the sugarcane juice stall in Batu Arang, and once at the PETRONAS station in Kuang. After Kuang we began to split into smaller groups as some of us reduced the pace to cope with the noon time heat. We made regular stops to allow the group to reform. Everytime we stopped, it was in a patch of shade. With 10km / 6mi to go my face matched the colour of the staircase behind me. The perfect end to the ride was a few bowls of ice cold cendol. And some rojak. I had to be elsewhere, so I missed out. There will be a next time very soon. We have a videographer now. Thank you Alvin. Posted in Cycling in Malaysia and tagged Batu Arang, Flipside, Guthrie Corridor Expressway, Ijok, Kampung Kuantan, Restoran Ijok, Thank You. Bookmark the permalink. Last Sunday’s easy ride was not a true indication of my physical conditioning. I couldn’t have expected anything different. The result of three months of idleness is that my heart rate races from the effort of clipping in to my pedals, let alone from trying to hold my spot in a pace line. My three rides so far just confirmed I have a long road ahead of me to regain the fitness I had in June. Today’s test was a ride with nine other Flipsiders. 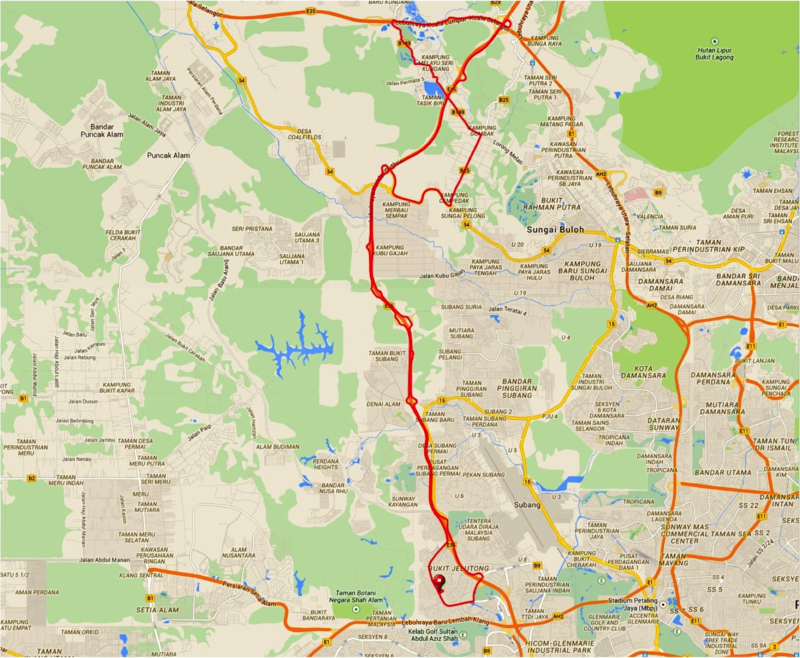 We rode from D’Bayu in Bukit Jelutong to Ijok for breakfast, and then looped through Bestari Jaya to Batu Arang, and returned to the Guthrie Corridor Expressway for the ride back to Bukit Jelutong. Fortunately for me the group made frequent stops. This is a regular one, at the point where we leave the Expressway to get onto Jalan Kuala Selangor. 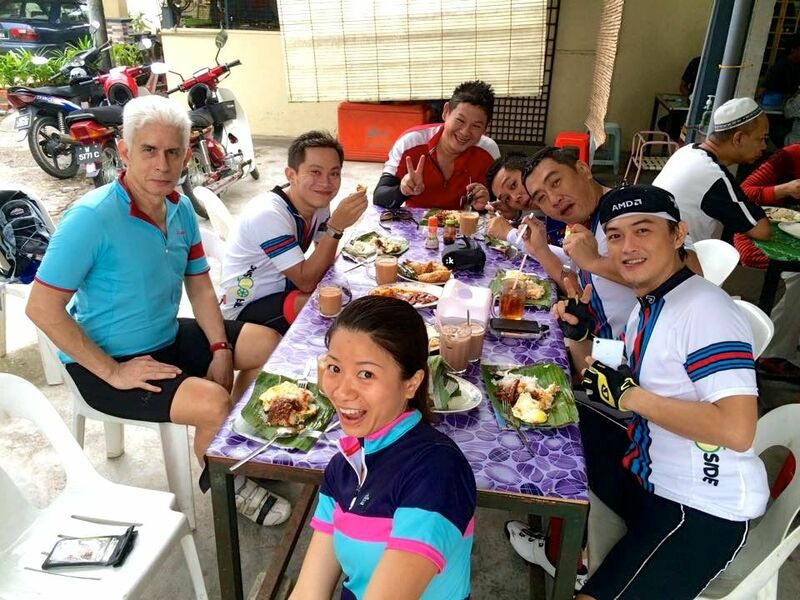 We got to the wanton noodles shop in Ijok 35 kms into the ride. We stacked our bikes against a wall and piled into the shop. There is an Alchemy bicycle somewhere in there. The rest of the guys settled down to their noodles while Shahfiq and I went to see why there was a crowd around a roadside stall a hundred meters away. 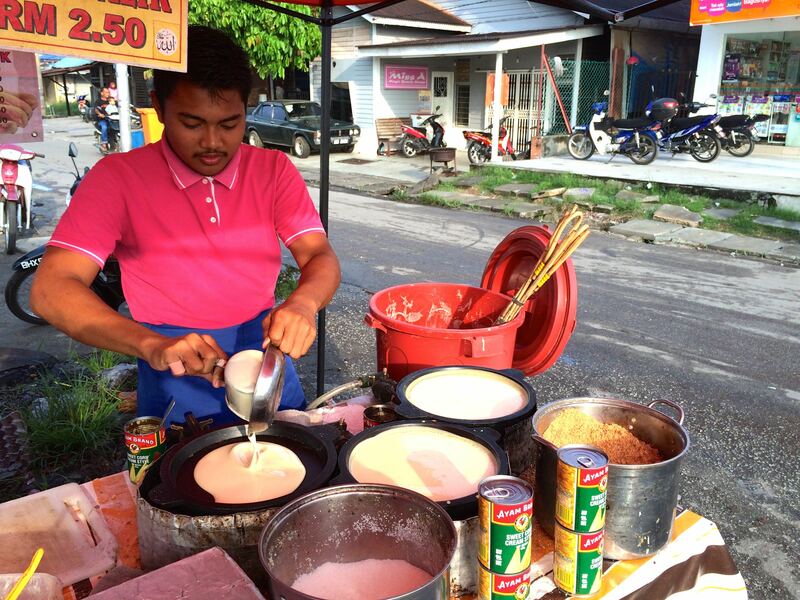 On sale was nasi lemak, fried chicken, a variety of curries, fried eggs . . . . and freshly made apam balik. Peanut pancakes for breakfast for me please! I needed all those calories once we got to Bestari Jaya. The road from Ijok to Bestari Jaya (right to left in the graphic below) was pancake flat. As soon as we made the right turn toward Batu Arang the road got very lumpy. That was my cue to fall behind the others yet again as my lack of power and endurance showed on the climbs. And again the guys helped me out by stopping until I caught up. This was one of the few flat sections on the way to Batu Arang. The next stop was only 5 kms down the road in Batu Arang. There is a small roadside stall selling fresh sugarcane juice. Really fresh sugarcane juice. The canes go through the crusher three times. The juice is strained into a pitcher before being poured into ice-filled glasses. Those cold drinks were most welcome. The sun had been beating down on us since we left Ijok, and the heat was leaving its mark on us all. I was in survival mode for the remainder of the ride. My average heart rate for the entire ride was 135 bpm. My average heart rate for the final 40 kms was 140 bpm. Despite my efforts to spin in as light a gear as possible to keep my heart rate down. We made our regular final stop at the Elmina R&R for a cold drink from the shop there. We got back to D’Bayu at Bukit Jelutong with a couple of kilometers less than a metric century on our cycling computers. I can be as competitive as the next person when the mood strikes me. If the guys were going to do a 2 kilometer loop to make it a century ride, then so was I. Posted in Cycling in Malaysia and tagged Alchemy, Batu Arang, Chocolate Milk, Flipside, Guthrie Corridor Expressway, Ijok, Wanton Noodles. Bookmark the permalink. 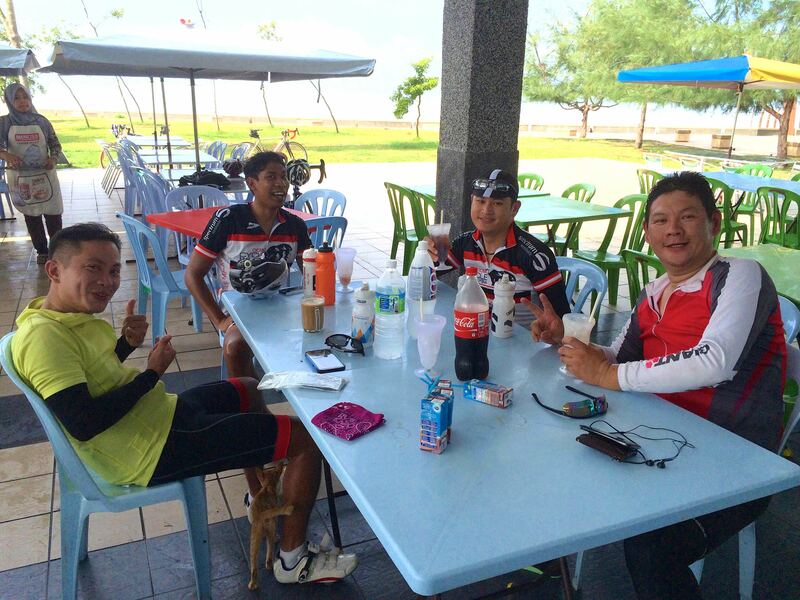 After the epicness of the ride to Morib, my Flipside buddies and I agreed that we needed a gentle recovery ride the following day. A 25 km or so ride to Bandar Botanik, a stop for a spot of breakfast, and another 25 km back again would fit the bill. Seven Flipsiders said that they would do the ride. At 6.45am there were just three of us at the start point. The others missed a very nice ride. We covered the same ground as we did on the way to Morib the day before. This time without the extra loop at the beginning of the ride. The route is a bit up and down over the first 8 km, but the rest is as flat as a pancake. Throw in some canals and some cows, and I could be convinced I was riding around Den Haag! Eric was 50 meters ahead of Marvin and I as we rolled into Bandar Botanik. We both heard the pop as Eric’s front tire gave way. Upon inspection we found a tear in the sidewall of the tire. I always carry a small sheet of rubber in my tool roll to use as a boot, so Eric was able to keep going on his damaged tire after replacing the tube. Not that we went very far before stopping again. We found a breakfast place all of 500 meters away from where Eric’s tire had failed. There certainly was quite a variety of food to choose from. Marvin ended up putting three types of fried noodles on his plate. We were all well-nourished for the ride back to Bandar Sunway. The morning was overcast and pleasantly cool when we started the ride. Thankfully it stayed that way for most of the return leg. We averaged 24.5 kph. 2 kph or 8% slower than I had ridden the day before. That 8% slower pace translated into a 21% or 29 bpm drop in my average heart rate. Hence the thumbs up from me, and the smiles from Marvin and Eric, at the end of this ride. A very different end to the ride as compared to the day before. 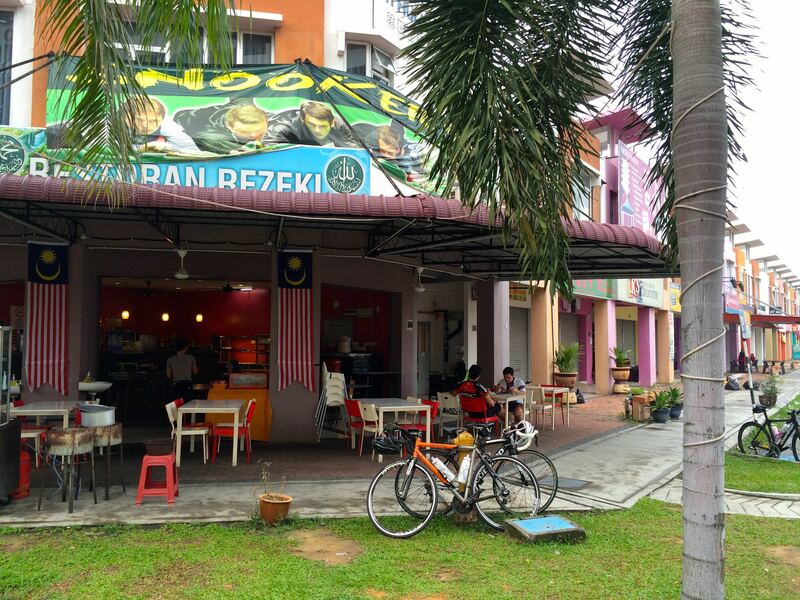 Posted in Cycling in Malaysia and tagged Bandar Botanik, Flipside. Bookmark the permalink. 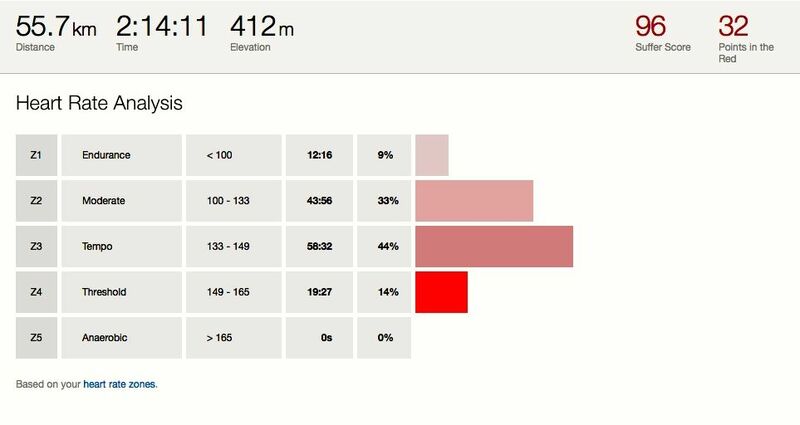 Strava displays a “Suffer Score” along with other summary information about each ride that you upload. 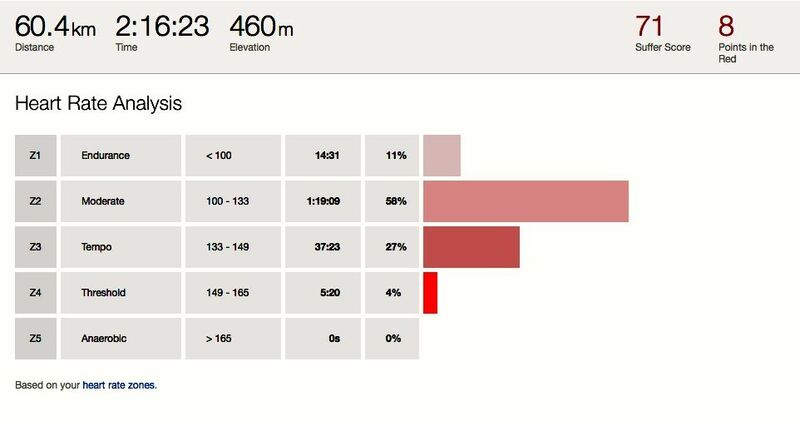 The Suffer Score is a value calculated using your heart rate during a ride relative to your maximum heart rate, and the distance ridden. The higher your Suffer Score, the harder you worked during that ride. A descriptor is assigned to Suffer Scores. 100 to 150 is a Tough score. 151 to 250 is an Extreme score. Anything greater than 250 is an Epic score. I have only twice had a Suffer Score in the Epic category. 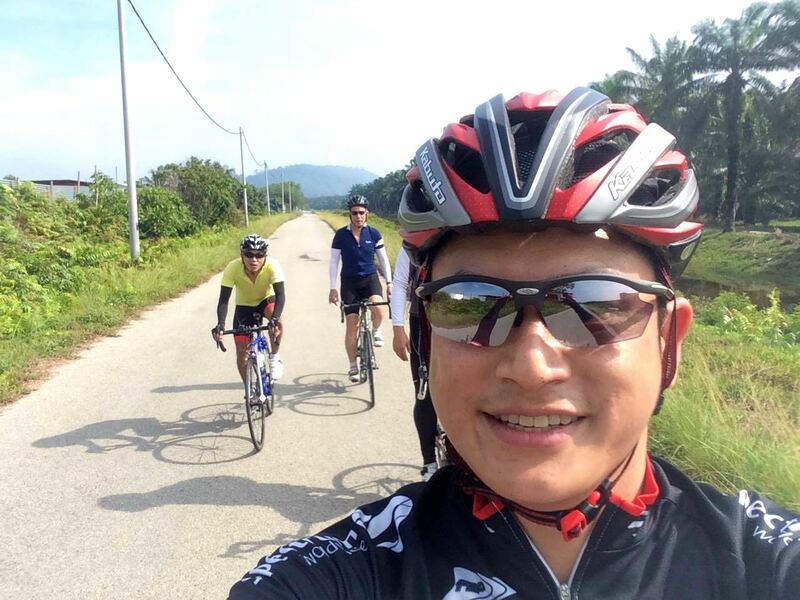 The first was during the Kuantan Century Ride last year. My average speed was 28 kph. My average heart rate during that ride was 144 bpm, over a distance of 161 km. I felt trashed for the last 20 kms of that ride. My second Epic effort was yesterday. 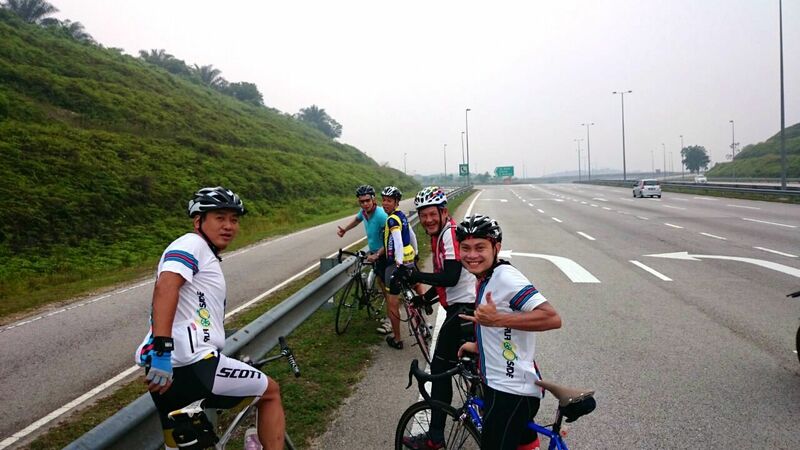 I rode with four other Flipsiders from Bandar Sunway to Morib and back. This ride was 133km. My average speed was 26.6 kph. Despite the shorter distance and lower average speed, my heart rate averaged 140 bpm. Not much less than it was during the Kuantan ride. And again I felt trashed for the last 20 kms of the ride. I have had rides that had a lot more climbing, and were therefore more difficult – although this wasn’t easy either, given that the sun was beating down and that the temperature felt like 36 °Celsius. 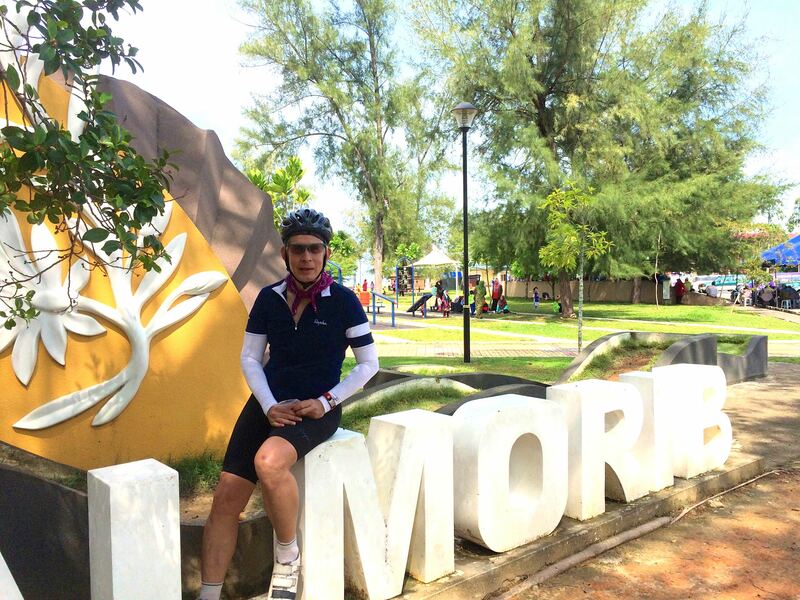 I suffered, despite the flatness of the Morib ride, due to an alarming lack of fitness. I knew that being inactive for more than three months would have a negative effect, but I didn’t expect it to be this bad. The route took us west along the KESAS Highway. It was my first time riding west of Sunway Lagoon, though my companions have done this ride before. We exited the KESAS Highway at the Bandar Botanik interchange, where we turned left onto Jalan Langat. 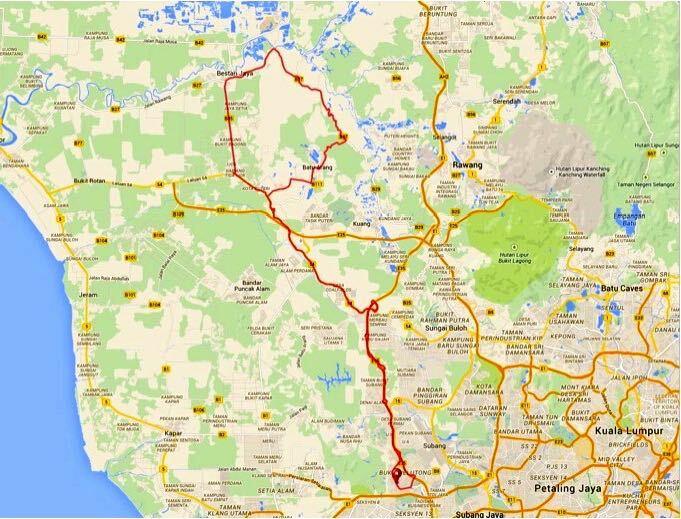 I have been on that section of road before, during the ride to Port Dickson, and during the Klang Premiere Century ride. We weren’t on Jalan Langat very long before we had to make a stop at a PETRONAS petrol station. Justin had a flat tire. I took the opportunity to take an opportunistic photograph. We had stopped at the PETRONAS Johan Setia. Two hours into the ride my left arm and shoulder had started aching. 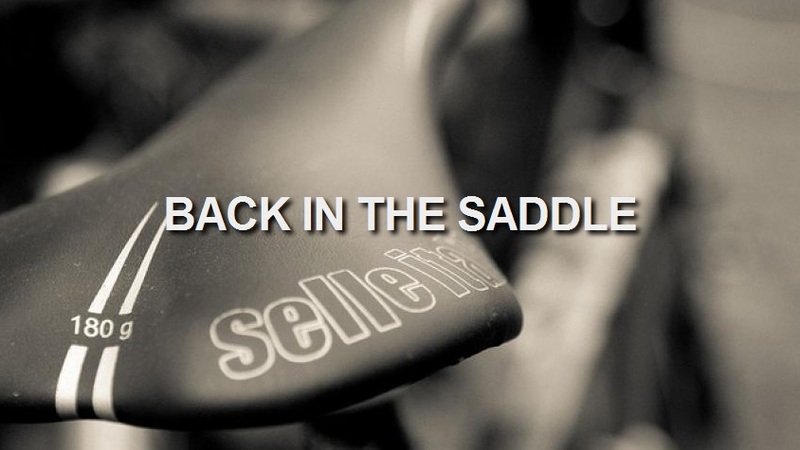 I spent a lot of time sitting up on my saddle to give my arm and shoulder a rest. Marco is smiling in his selfie, but you can see that Mark and I are wilting in the heat. At this point we had another fifteen kilometers to go before we got to Morib. Those were some of the longest kilometers I have ever ridden. 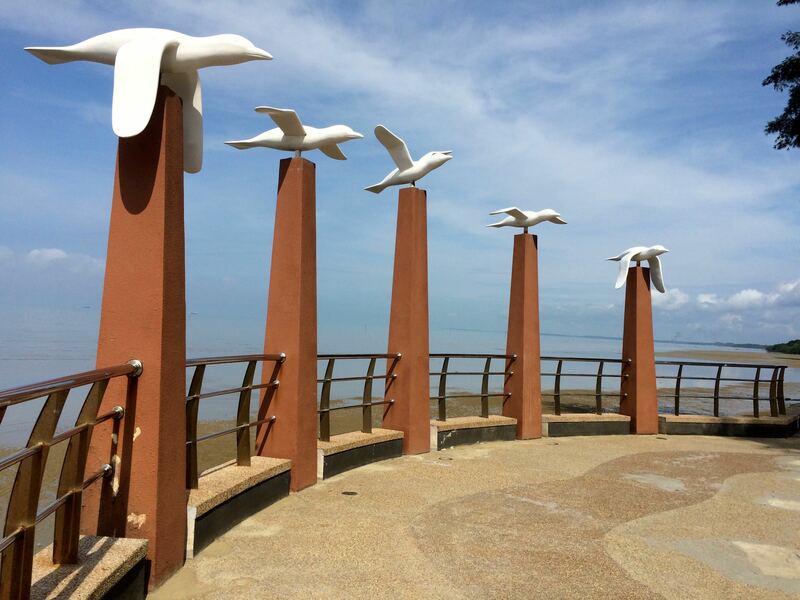 It was a relief to finally arrive at Taman Seri Bayou Morib. Marked on the beach side by this pretty art installation. We had ridden 75 kilometers. There were serious doubts in my mind that I would make it all the way back to Sunway. I didn’t look it at the time, but I did feel somewhat rejuvenated after these. Four cartons of cold chocolate milk. The others looked cheery while waiting for their nasi lemak. I had some too. It was very good. It was about 11.00am when we started the return leg. This wasn’t the last sit-down I needed before we got back to Bandar Sunway. The return leg was 17 kms shorter than the outbound leg. 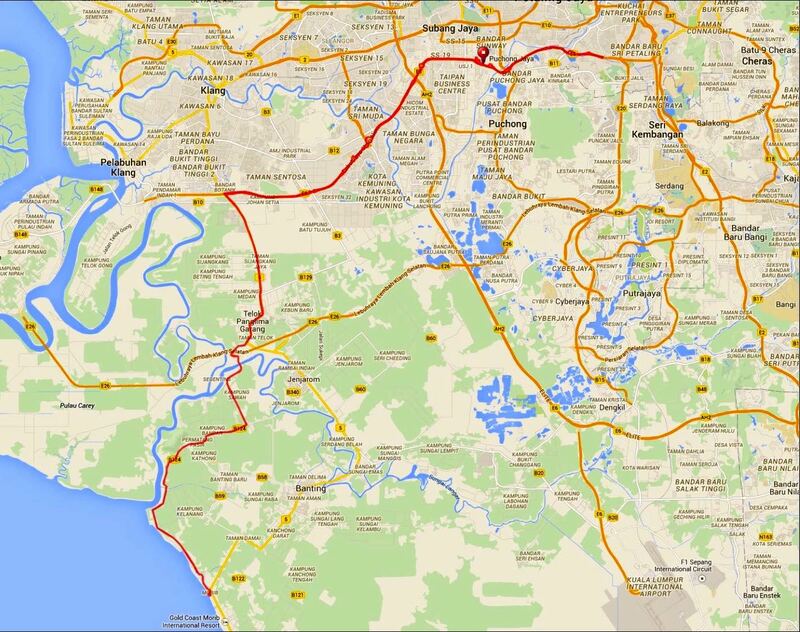 We had done a loop to the east of Bandar Sunway at the start. Despite the shorter homeward distance, my average speed dropped from 27.6 kph to 25.5 kph. Even with the slower pace, my average heart rate went up from 137 bpm to 145 bpm. That must be when my Suffer Score ventured into Epic territory. I really was struggling over the last 20 kms. I kept looking at my Garmin, convinced that I had covered three or four kilometers since the last time I checked it. Only to find that I was only fifteen hundred meters further forward. Right about the time I was going to pack it in and collapse on the edge of the road, a rest area hove into view. There was only about 6 kms to go, but I wouldn’t have made it without that final fifteen minute rest in the air-conditioned PETRONAS shop – and without an ice-cream. I would have preferred an easier ride. Especially after such a long time off the bike. 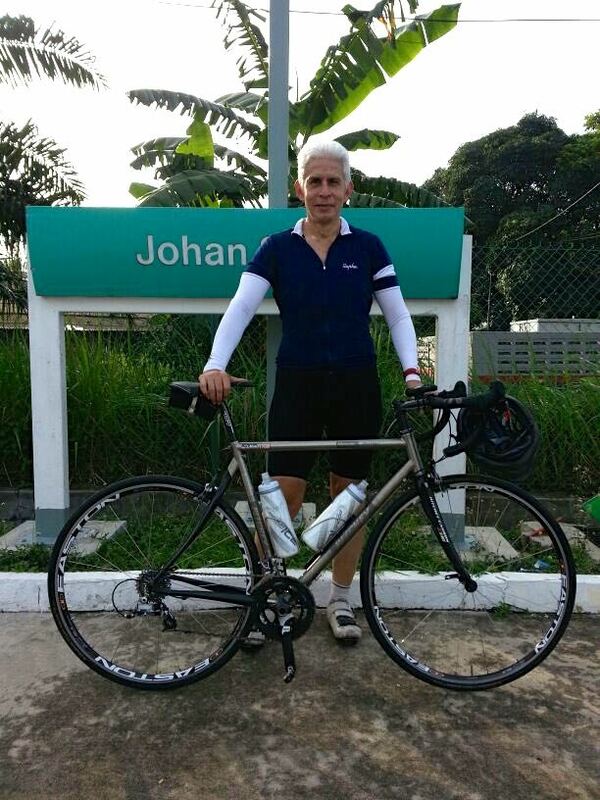 It does however make me believe that I will finish the Malacca Century Ride next Sunday. Hopefully it won’t be another Epic! 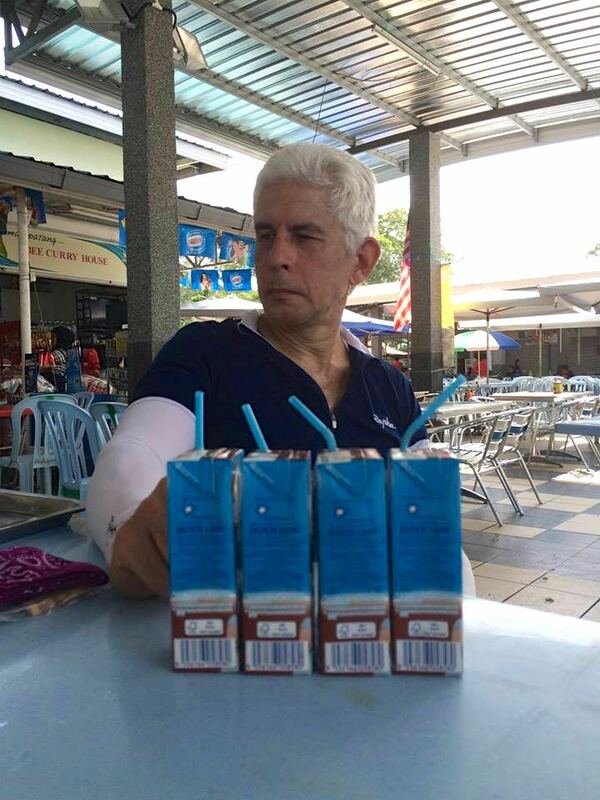 Posted in Cycling in Malaysia and tagged Chocolate Mik, Flipside, Heart rate, Heat, KESAS, Nasi Lemak, Strava, Suffer Score. Bookmark the permalink. My last bike ride was on July 5th. 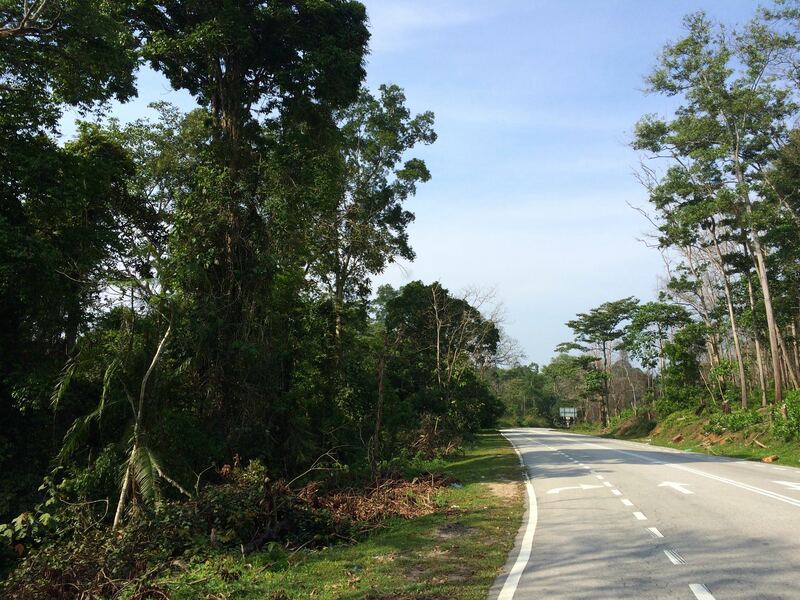 The day I crashed on the descent of Fraser’s Hill. On July 14th I had surgery to drain an anorectal abscess. On 23rd August I had a second surgery to repair a fistula that was the cause of the abscess. While recovery from the injuries incurred in the crash is still ongoing, I could have started riding again at least a month ago. However my surgeon had other ideas. He did not want me to risk compromising the healing of the wound that he created when he opened up the fistula. So instead of sitting on my saddle, I spent seven weeks sitting in a sitz bath twice a day. I got the ‘all clear’ to ride last Saturday. 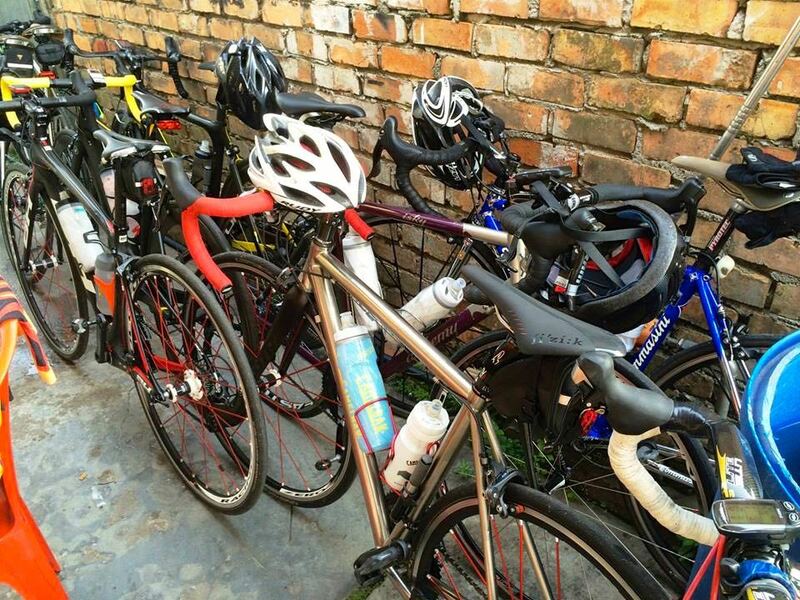 Some of my Flipside friends agreed to spend their Sunday morning riding with me to Kampung Kundang and back. It is a route that we have ridden many times. We followed the Guthrie Corridor Expressway to the Kuala Selangor exit. Here we are at that exit, waiting for Marco and Natasha. Our intermediate destination was Seleria Ria along Jalan Kuang. I didn’t eat all those packets of nasi lemak. They were shared amongst us all. I throughly enjoyed the 56km ride. The weather was mild, and my riding companions maintained a reasonable pace. Nevertheless, it felt like hard work. The three-month layoff clearly eroded my fitness levels. A comparison of my heart rate during this ride, and my heart rate during a very similar ride in June, illustrates this. My average heart rate during this ride was 130 beats per minute. My average speed was 25 kilometers per hour. My average heart rate four months ago was 120 bpm, at an average speed of 26.5 kph. I need to rebuild my fitness. I also need to continue to strengthen my left arm. The nerves I damaged in the Fraser’s Hill crash will take at least another two months to repair. My arm is significantly stronger than it was a few months ago, but it has not returned to full-strength, and it still tires easily. I struggled to hold my position on my bike in the last forty five minutes of the ride. 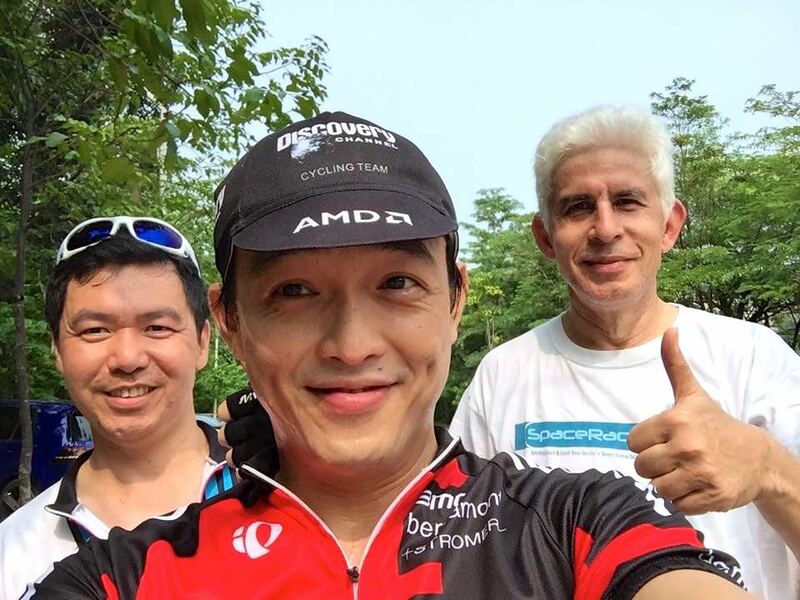 I have another week to build up my fitness in preparation for the Melaka Century Ride. Wish me well! 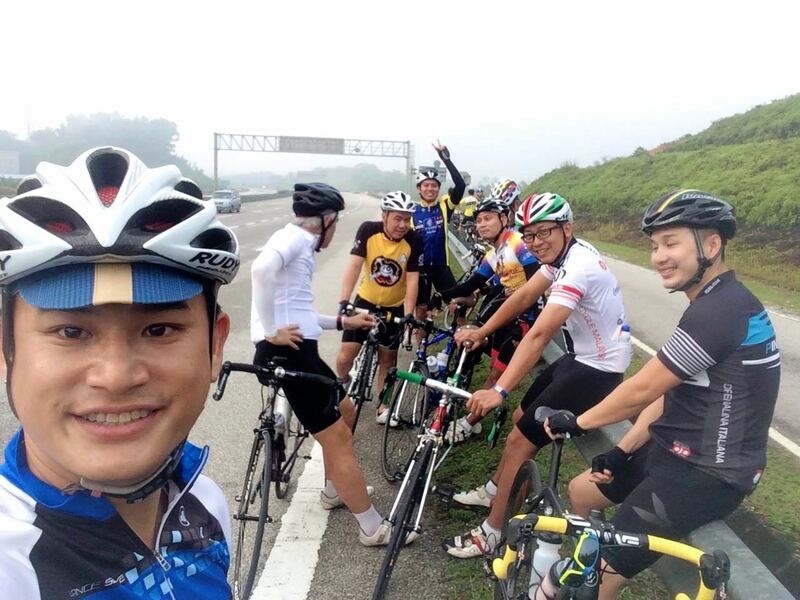 Posted in Cycling in Malaysia and tagged Flipside, Fraser's Hill, Guthrie Corridor Expressway, Selera Ria. Bookmark the permalink.